Last week I had an email inviting me to join in with the Room for Improvement competiton hosted by MoneySupermarket.com. 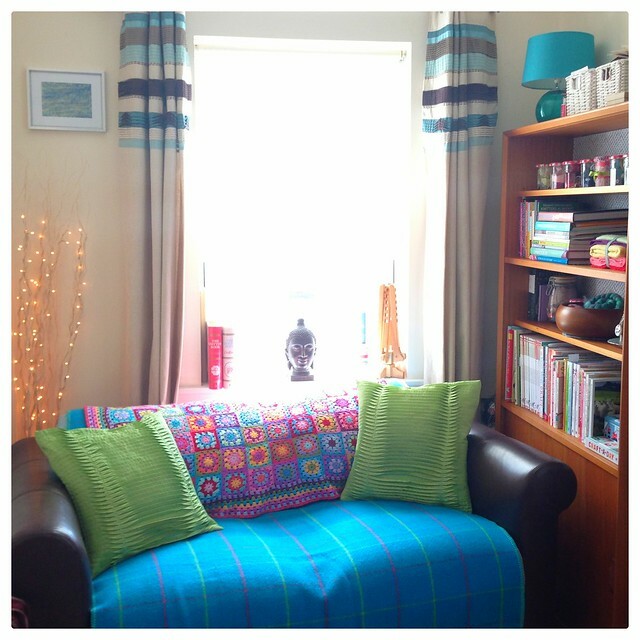 The brief was simple - to improve one room in my house... for only £50! Considering our recent kitchen makeover cost a small fortune, I knew that the £50 limit would be a real challenge, and on top of that I had only one week to complete my transformation... and I'd be away for part of it! Considering the time and financial constraints, there was only one room I could consider - the Cwtch. It ended up being 'made-over' in just one afternoon. After enrolling Mum's help, this is what we did yesterday. BEFORE: A tiny cluttered room which is visible from the entrance hall of the house and didn't create a great first impression. 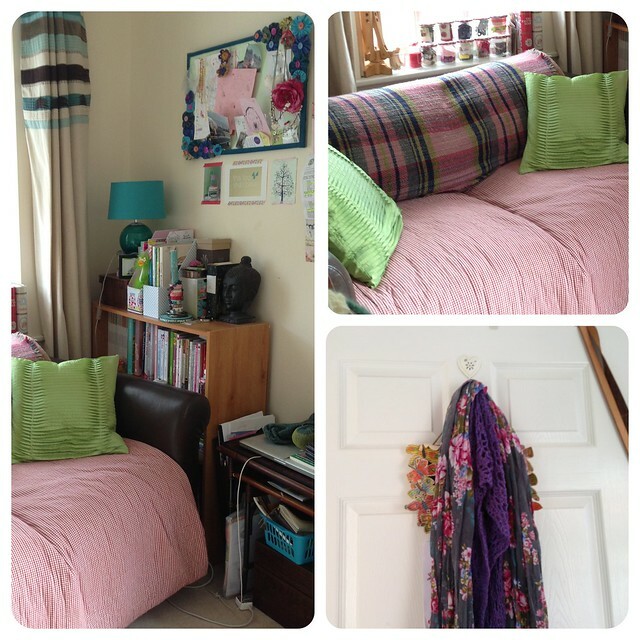 To make the room look neat and less cluttered while still having everything to hand. To clear the windowsill behind the sofa. To remove the clutter from the door, while keeping my things accessible. To make the sofa look less like a bed (ie get rid of the pink bedspread), and more co-ordinated with the rest of the room. Any changes had to be in keeping with the vintage cabinet previously rescued from the recycling, so modern-looking things were definitely out! £5 - Folding wooden table from charity shop. This was my first find and the perfect size for my laptop. When I'm not using it, it folds up small enough to slot between the sofa and the cabinet. £3 - Hanger for the back of the door from TK Maxx - (damaged / some ceramic beads missing). With everything hanging on the back of the door, it's all out of sight from the hallway and it doesn't matter that there are missing beads, although they would be easy enough to replace with fimo. £19.99 - Blue throw from TK Maxx. It's woollen, it's blue and it has stripes the same colour as my cushions. What's not to love? 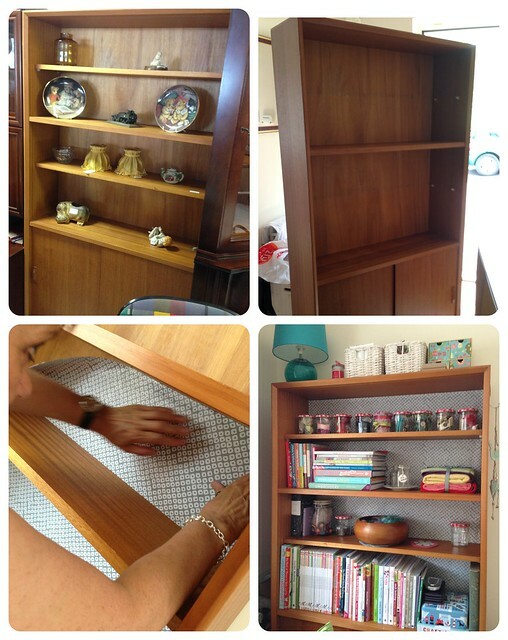 £22 - Vintage cabinet - half price sale in charity shop!!! The cabinet was definitely the best find. We had stopped off at a charity shop on the road to Horsham, not expecting to find anything affordable and there happened to be a half price sale on "selected items" that day. Most large furniture was excluded and way over budget - until we spotted this at the back of the store. We couldn't believe it was only £22 and quickly reserved it before finding out the delivery charge would be £20 - too much for our budget. Thankfully the lovely staff held onto it until we went back in D's Land Rover and managed to bring it home ourselves. A bit of glue and wrapping paper later and I love it. Some pretty vintage wallpaper would have been better - but it was necessary to work with what we had! The cabinet is big enough for all my things (the cupboard at the bottom is hiding a multitude of papers and magazines) and looks so much nicer than the rickety old bookshelf that was there before. Most importantly it totally feels in keeping with my other storage and the vintage vibe and somehow, it has made the room feel bigger. There are still some things I would like to do (a café curtain at the window, another bowl jumper for the wooden bowl on the cabinet...) but they won't be finished within the time limit (or budget) for the competition. I'm really pleased to have been invited to participate - the room really needed a facelift and it gave me the motivation to get on with it. I wouldn't have imagined £50 could make such a difference! That is totally a good makeover! Such a good find with the cabinet....I would love to go out and do something like this! Great job. The room really does look more cohesive and inviting. I'm impressed! I'm glad you got a chance to do this. I couldn't manage to take part. The room is vastly improved. I think you managed incredibly well on a really tight budget. Wow! I love everything about that room and wish could come for a visit and sit in it. It looks totally pulled together. I really like the colors you chose-and the lighted twigs? Love them! It looks great!! wow, amazing how different it looks. I love the cabinet, and the table, and the couch cover, and well everything! You are so clever! Our office is the dumping ground, a room I am planning to clean out this month. 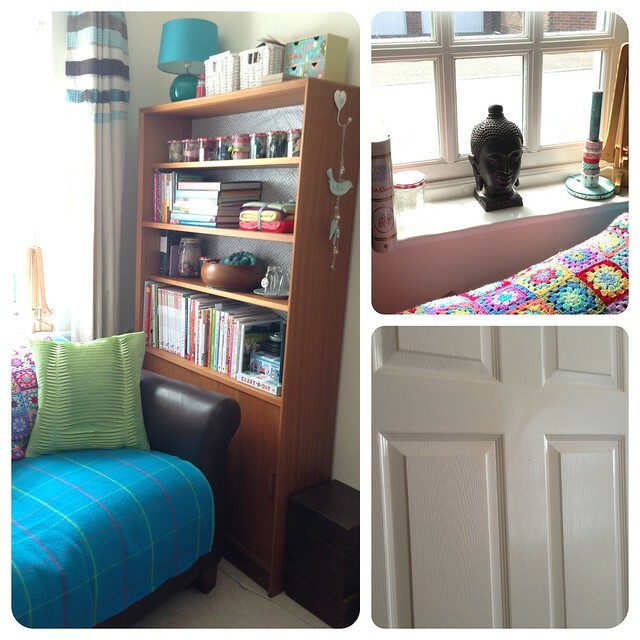 My eldest wants her own room. 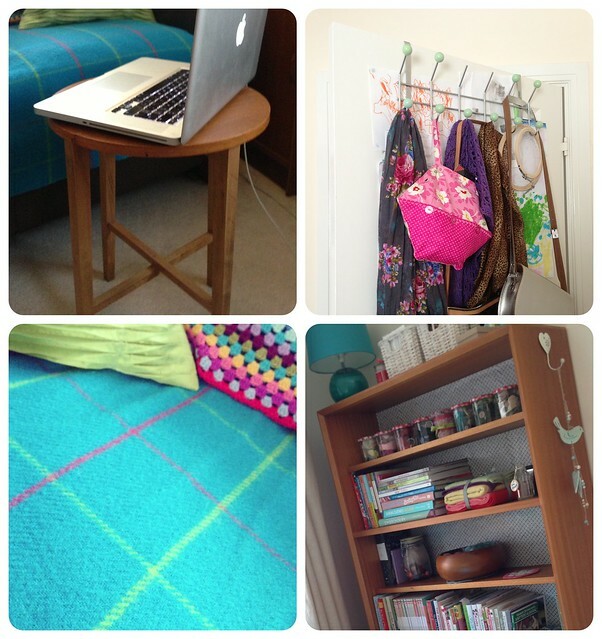 I love your room re-model and hope one day to have a lovely little craft room (cwtch) of my own. I love the book case with the wrapping paper backsplash! Such a clever idea.